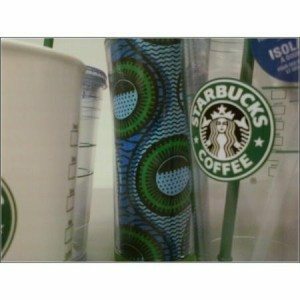 This blog is about encouraging Starbucks customers to use a personal tumbler or ask for their beverage in for-here ware. Yes, of course I believe that recycling paper cups is a good idea, but there is much more to the story than simply the paper cup itself. The story is really about consumer habit and resistance to any modus operandi a little less convenient to them. This has to change. There is work to be done here, and we can only create consumer change if we start the conversation on why it has to change. (Some of the above mystarbucksidea.com are closed or merged threads). I participate heavily on mystarbucksidea.com and often want to write long responses to these kinds of threads, but that site is not conducive to long posts. These many repetitive threads shouting at Starbucks to please recycle paper cups are the inspiration for this blog post. The above you-tube video is a little dated. For example it states that there are NO recycle bins at Starbucks. As I write this in November 2009, that no longer is a completely true statement. Increasingly, as stores get remodeled, and new LEED Certified stores open, we see recycle bins in here and there. As I hear about company-operated Starbucks stores with recycle bins included in them, I’d be glad to add them to this list. PLEASE email me if you know of a company-operated Starbucks with recycle bins. Use the “Contact” form associated with this website or email me at sbux206@starbucksmelody.com. If 100 people a day brought in their own personal tumbler, annually Starbucks would use about 921,700 fewer paper cups each year! That’s a lot of paper cups. That’s almost a million cups! When baristas ring a transaction as including a personal cup discount, that data gets collected and mined and used to supply information in the Annual Shared Planet report. There is no doubt, there is more personal cup usage than the appalling low number in the Shared Planet report due to forgotten cup discounts. When you bring in your own cup, Starbucks gives you ten-cents off your drink purchase. When a cup discount is forgotten, I think the barista should re-ring the transaction to include the cup discount. It is the only way to make a difference and make your mark as a person using your own tumbler. Unfortunately, in my own experience, it is rare for a barista to re-ring the transaction. I cringe, but most commonly I see baristas reach into the tip jar and pull out a dime. And I’m left thinking, “it’s not about your dime. I didn’t mean to tip a dime less. I want to make a difference with Starbucks.” I’ve stopped arguing with baristas though. Most seem to think I actually want a dime, and I get some really odd looks if I say things like, “I’m trying to make a difference with Starbucks”. At a fundamental level though, I think most customers would say that making a difference to the planet is the reason why they use their own tumbler, and it’s not about the dime. So this discussion begs the all important question, ‘what percentage of customers are using a personal cup?’. The answer is 1.3 percent. This is appallingly low. Less than 2 out of 100 customers walk in with a personal tumbler in their hands. Even more surprising, according to Starbucks, this number is a fairly constant and stable number over a pattern of several years. This is shocking! Customers, please bring in your own cup!! If you want to claim environmental friendliness, then you’ll make it a habit to have a cup in your car, in backpack, in your briefcase, it needs to be part of your routine. 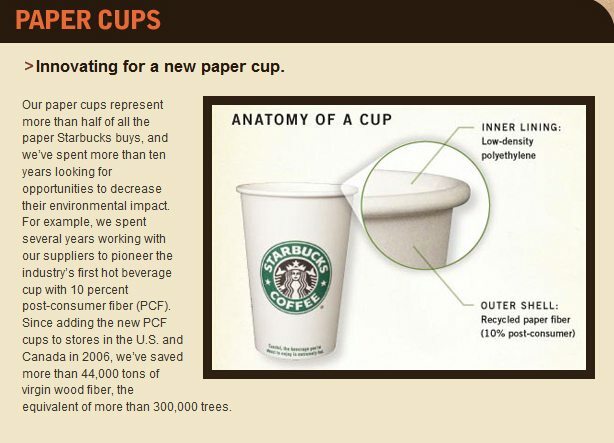 What if Starbucks used a million fewer paper cups each year? How about five million? All I know is that with personal cup usage at an appalling low rate, there is huge room to save trees, landfills, and energy … All by YOU making a commitment not to use a paper cup. “A lot of our customers are also working to reduce their own environmental impact even as we are. To help them help us, we offer a 10-cent discount in the U.S. and Canada to encourage customers to use their own reuable (sic) mugs for their beverages. Customers staying in a store can also request that their beverages be served in a ceramic mug. 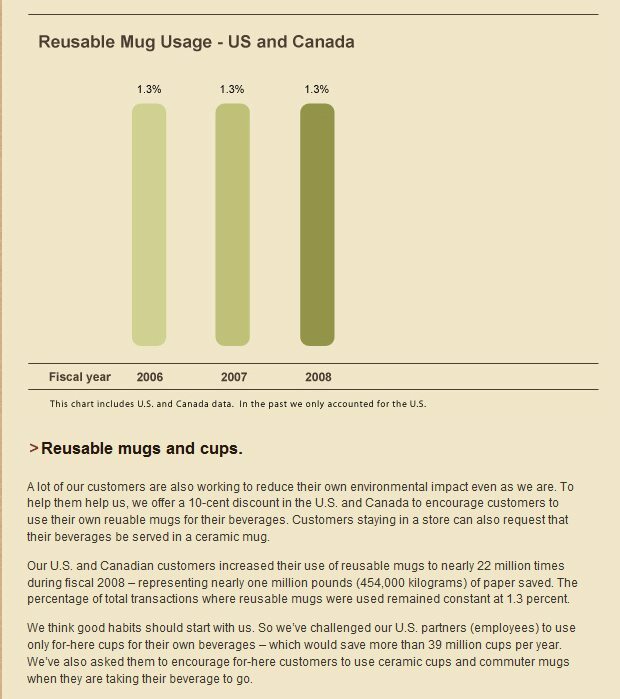 Our U.S. and Canadian customers increased their use of reusable mugs to nearly 22 million times during fiscal 2008 – representing nearly one million pounds (454,000 kilograms) of paper saved. 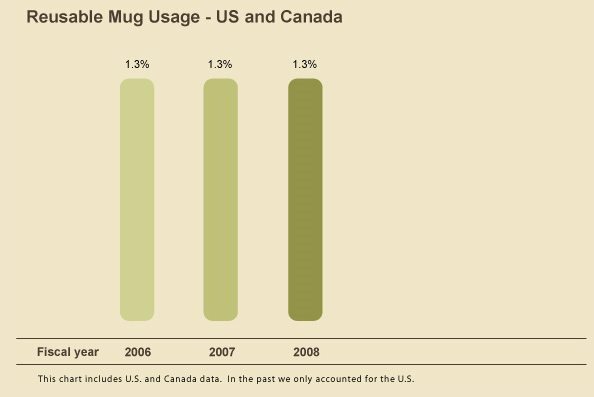 The percentage of total transactions where reusable mugs were used remained constant at 1.3 percent. Starbucks customers need to get into the habit of using their own tumbler. There are lots of good reasons to use your own cup. First off, you save ten-cents on your beverage. Secondly, it is less likely that someone will mistakenly grab the wrong drink. In addition, a customer’s drink will stay warmer longer in a stainless steel tumbler than a paper cup. And the beverage will taste better! Many people ask the question, “Why isn’t the Starbucks paper cup easily recycled?” The answer is that the cup includes a very fine plastic lining inside of it which is what gives the cup its superb durability. The Starbucks paper cup was designed to hold very hot beverages and not burn the hands, and not deteriorate when full with very hot coffee. The current Starbucks paper cup has an outer-shell which is composed of ten-percent post-consumer recycled material, and then an inner lining of low density polyethylene. The current cup does have impact by reducing virgin tree wood because of the recycled paper fiber in the cup, but it simply doesn’t function as the “green” cup that many consumers and Starbucks partners aspire to proudly show off in their hands. The current paper cup IS fully recyclable in some cities, but the overwhelming majority of municipalities and jurisdictions will not recycle this current cup due to its polyethylene plastic lining. The future of the Starbucks paper cup is the quest for an easily recyclable paper cup. I question whether Starbucks will ever find anything quite as durable as the current cup sans plastic lining. But that is the challenge. In May 2009, Starbucks hosted a Cup Summit at their headquarters. Starbucks brought together thinkers, retailers, cup producers, and stakeholders all in one place to advance the goal of the fully recyclable cup. Of course in tandem with the goal of the fully recyclable paper cup, is the goal of increasing personal cup use and for-here ware use at Starbucks stores. 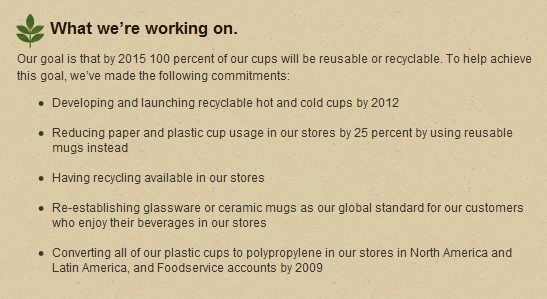 The time-frame announced by Starbucks for the recyclable cup is that Starbucks plans to develop and launch this cup by 2012, and that it will be in wide-spread use by 2015. Starbucks has stated that when the cup is first developed, it will be tested in key metropolitan markets first, and then its use expanded further to more locations. These goals can be found in the Shared Planet report and Starbucks blogs too. It might be a silly idea, but what about a rotating travel mug system? You buy a special mug, and when you bring it in, they will give your drink in a cleaned and sanitized travel mug/cup and then clean and sanitize the one you brought in for a future customer. This might help with health codes/sanitation, standardize the mugs for the purposes of consistent drink prep, and help the environment. I think a “tax” on disposable products purchased from coffee chains would be a good idea, this would be set aside to pay for the proper sorting of the coated cups so they do not end up in the landfill. This would mean that customers are paying to recycle their own paper waste, but the cost would be very small on a per-customer basis. ok wait a minute. where am I????? Is this the thread about today……it’s 4/15/10 and 8:17A (cst) now. I feel confused. ???? ps: to the comment back in January from “tracy’, seen here about sharing tumblers: I definitely don’t want to be using anyone else’s tumbler. I realize we all share china and silverware all the time……but these tumblers are not ‘dishwasher safe’ and also, imo, much harder to really clean than a normal cup……the lids, the grooves, etc. I just don’t see that happening. hopefully. I do get where your heart was about this, tho. yeah, the sharing tumblers thing …. i like where you’re going Tracy but agree with Denise in that mugs can get so gross. i think the idea could totally work if Starbucks could make a dishwasher-safe mug w/o grooves. isn’t there some way to do away with all the little grooves and crevices? i hate travel mugs for this very reason (though I found that the new ceramic starbucks mug is pretty good about that) and even then i don’t even trust myself to get all the crusted coffee out of the grooves and the rubber rings. maybe people could just share the mug bottoms (and make those dishwasher safe) and have people maintain their own lids, ‘cos that’s where all the grossness, if any, is going to sit. Thank you, Melody, for your wonderful post! One cup at a time! I spent the last three years living in Cheltenham, England, where you you are asked “for here or to go?” if you reply for here you automatically get a mug. So far so good. Downside, uk Sbux never hire enough staff and there is nowhere for customers to place used mugs, plates, etc. so they stay on the tables until someone has time to collect them. Uk Sbux are gross. Downside no 2 all these cups and plates need to be washed, and dried. It has been known for a Sbux to run out of clean mugs, also this uses up water and electricity and necessitates the use of detergent. Finally, I regularly place my commuter cups in the dishwasher. They’re fine on the top shelf as long as you aren’t doing a mega hot wash.